Located in southeastern Vermont, Vermont Academy is a private boarding school for grades 9 through 12. For much of its recent history, the outdoors-centric school has had its own ski area. Vermont Academy's first lift served ski area dates back to at least the 1950s, when farmland south of campus was used for a rope tow operation headed up by Warren Chivers. Consisting of nearly half a dozen trails, the area remained in operation through the mid 1990s. A decade later, trustee and alumnus David E. Robinson funded the development of a new ski center on campus. Permitting took place in early 2002 for a small facility that was to support both alpine skiing and ski jumping. The surface lift served ski area may have opened as early as the winter of 2002-2003. 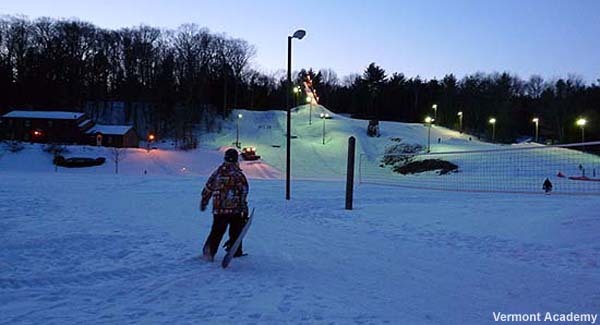 It features snowmaking, grooming, and night skiing.